This little ficlet I've written as a comment_fic for a pic of our julchen11. I hope you will like it, too. Zeke stepped onto the porch for his wake-up cigarette ... and stiffened in every movement. Not enough that it there had been a lot freshly fallen snow overnight what means that he would have to clear the driveway once again. In the middle of his yard was sitting a big snowman. With a colorful scarf around his neck, a bubble hat ... and a cat on its shoulder. A cat! A slight giggling let him look up and he noticed Casey. Of course, it was him. No one else would stand up early on a Saturday morning to build a snowman. Now the boy stepped closer to the porch, smiling wide. His cheeks red from the cold, the eyes blue as ever. "Hey, Zeke. Aren't they cute?" 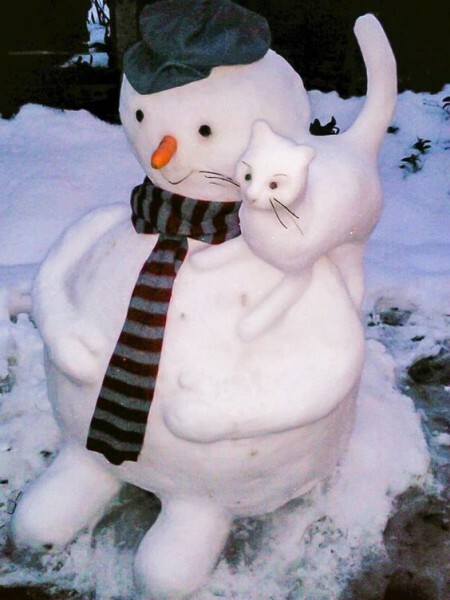 "Frosty and his kitty. It was about time that he got a companion, don't you think so?" Zeke smirked; it was so easy to read his mind. But it wouldn't work. He was so not a guy for pets. Cute or not. "Some people like to live alone," he snarled. "Just because they are not used to it to have a friend. As soon as they find one they can't imagine being alone again." Smart, little fucker. Almost against his will, Zeke thought about the two strayed kittens they had found in the woods yesterday. Half starved, half frozen. The shelter had already been closed, so they had brought them here, had given them some milk and he had agreed to let them stay overnight in the warmth of his garage. When he had looked after them some minutes ago, they had been still asleep on a pile of old clothes; purring slightly, obviously feeling comfortable. He hadn't been able to resist and had patted them slightly; the gray one had opened his eyes and blinked at him, licked over his hand, then he was fallen asleep again. Zeke had poured some milk in the old bowl, just in case they were hungry when they finally did wake up. Suddenly he noticed Casey's eyes resting on him and the satisfied grin on his face. As if he could read his mind. And he knew he had lost. I so love all your picture spams. They gave me so many ideas for a ficlet. That makes me soooo happy, my dear. And of Course - I'll always like our Boys!!! ALWAYS!!! Aww, this was so special! Thanks. Thanks. I'm glad that you like it.